Since the failed attempt to attack Canada from Hickory Island in late February 1838, an uneasy peace had settled along the Thousand Islands as the bulk of the Patriot army went back to their farms for spring planting. Into that lull stepped Bill Johnston and Donald McLeod at the head of a bold raid that became Johnston's signature event—the act that earned him his pirate moniker. Shortly after midnight on May 30, 1838, Johnston, McLeod and at least 21 handpicked raiders, some crudely disguised as Indians, began following a passenger steamer, the Sir Robert Peel, in two rowboats as the ship made her way up the American Channel beside Wellesley Island. The official battle plan was to steal the Peel and use it to capture another steamer, the Great Britain, the next day. Together, the ships would carry troops for a series of attacks on Canada. The Patriot cause was not their only motivation—Johnston and McLeod wanted revenge. 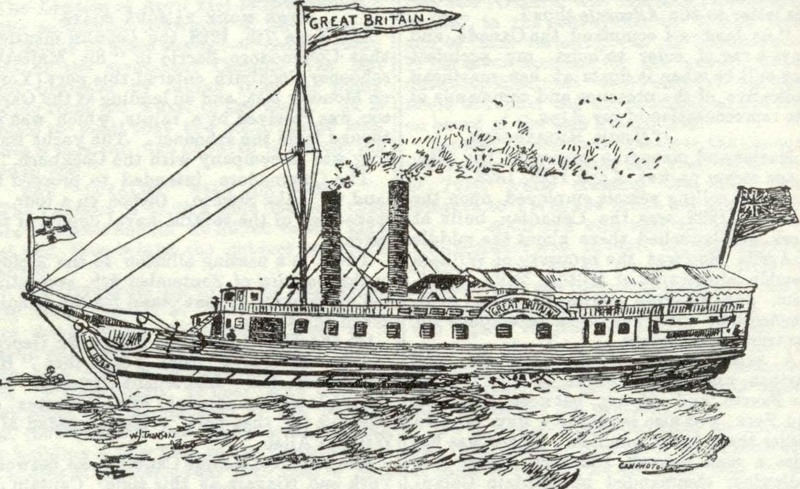 Drawing of the Great Britain. The Peel was similar in design but smaller. Days after the Patriot War began December 7, 1837 a loyalist mob trashed McLeod's printing office and threatened his life. McLeod fled to America. A few months later, his wife and sons escaped to Ogdensburg, NY, destitute and hungry. In a letter to a friend that May, McLeod promised "ample revenge." On December 29, the British burned the Patriot's supply ship, the Caroline, in US waters and killed an American sailor. The incident rekindled Johnston simmering hatred of the British and pulled him into the Patriot War. Most of the men in the boats with Johnston that rainy night were Canadians and veterans of the Hickory Island raid. Two Americans in the group, Lyman Leach and William Reynolds, had already played roles in the rebellion and who would go on to other famous encounters later that year. When the Peel stopped at McDonald's Wharf to take on a load of firewood (fuel for her boilers), Johnston's men landed 500 yards downstream and began to skulk through the dark forest towards the Peel. Nine raiders, including Leach and Reynolds, got lost. Besides Bill Johnston and Donald McLeod, 11 others gathered near the wharf and studied the Peel in the glow of her lamps: Hugh Scanlan, Samuel C. Frey, William Anderson, James Potts, Marshall Forward, William Nicholls, William Smith, brothers Chester and Seth Warner, Nathan Lee, and Henry Hunter. Prominent members of colonial Canada's Family Compact—the clique that spawned the Patriot War—including Judge Jonas Jones, owned the 160-foot-long passenger steamer. To Scanlan, the Jones connection to the ship must have seemed ironic given their meeting two months earlier in Watertown. Deciding not to wait for his lost men, Johnston ordered the charge. Letting out war whoops, the 13 raiders raced across the clearing and up the gangplank. Within a half hour, they had hustled the 80 sleepy passengers and crew at gunpoint to the wharf. Other than one fistfight, there was no violence and no serious injuries. Johnston ordered the ship untied and it drifted downstream. Johnston and McLeod later insisted rebel leaders had promised to send 150 men to help run the ship and take the Great Britain. Whether this is true or not, no one showed up. Since none of Johnston's men could restart the boilers, he ordered his men to loot the ship and burn it. With cries of "Remember the Caroline," they set it aflame and retreated in their boats. 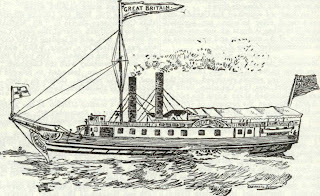 At dawn, another steamer took the stranded passengers to Kingston. Several prominent men claimed they were attacked by 80 ruffians—the truth being too embarrassing to admit. Within days, American constables arrested 13 of Johnston's pirate crew, including Scanlan, and recovered most of the stolen loot. Magistrates posted rewards for the others. (Peel passengers had identified every raider on the ship, while various spies likely fingered the others.) McLeod went into hiding and escaped arrest. The destruction of the Peel set off a massive manhunt for Johnston. For months, he was the most wanted man on both sides of the border. The British and American forces each mobilized a small armada and army to find him. Pirate Bill hid in the maze of the Thousand Islands, an archipelago no one knew better than he. For a dramatic and detailed account of the Peel raid, read "The Destruction of the Sir Robert Peel," a fact-based snippet from my novel. View copies of Donald McLeod's letters to his friend and his wife.